It's casual Friday and to celebrate I am wearing what is known as a dolman style blouse with jeans. What is dolman? Dolman is derived from the Turkish word for robe. It was originally defined as a loose fitting shirt/jacket with tight sleeves. Dolman eventually evolved to refer to a ladies blouse with a cape like silhouette. As you can see the sleeves are somewhat voluminous, especially in the armpits, thus qualify it as "dolman." This particular blouse is from Anna Sui for Anthropologie. It is referred to as the "Floriography" blouse for reference. I bought this blouse in a size 0 off of ebay a couple of years ago. It sold out in stores and online. With the magic of ebay I was able to track it down. I think this is when I first discovered the magic of blogs. I wasn't sure if a size 0 would fit or not, so I did research on various Anthro blogs for sizing advice. 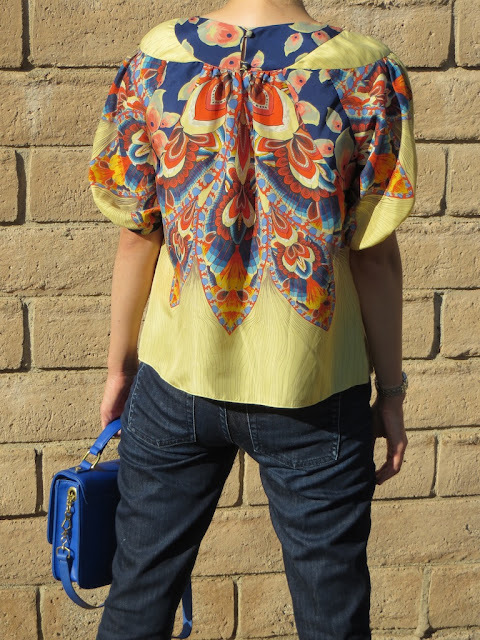 The pattern of this blouse is what initially attracted me to it a couple of years ago. I am not really sure how to articulate the pattern or the culture which it references. It could be a little South American, a little Egyptian perhaps or even slightly Indian. The jeans I am wearing are from J.Crew. They are the "Match Stick" style. The bag is also from J. Crew, known as the Edie in Casa Blanca blue. 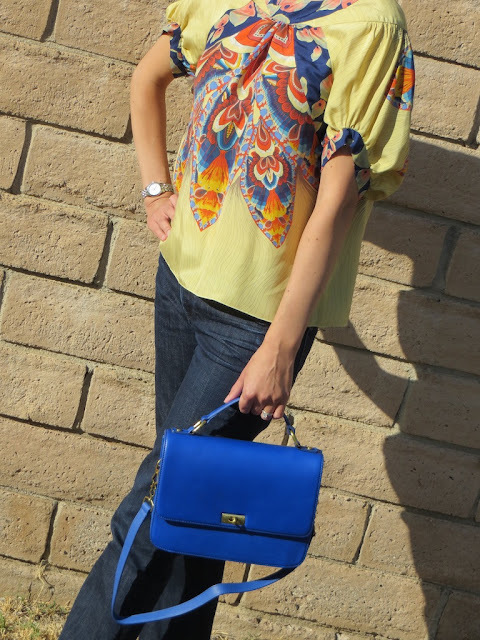 The colors in this blouse are so fun and rich it could go with numerous bags. 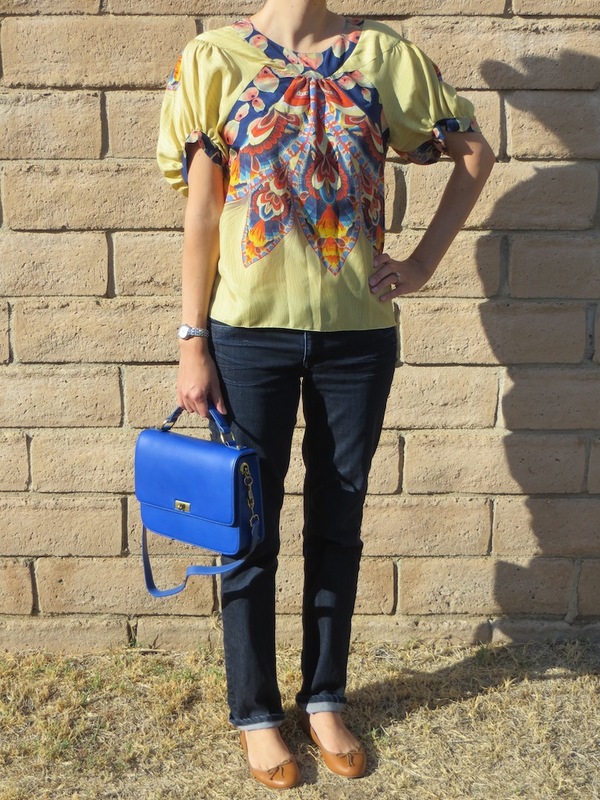 I liked the loose, carefree feel of the blouse paired with a more structured bag for contrast. This is sort of unrelated, but maybe a little related. 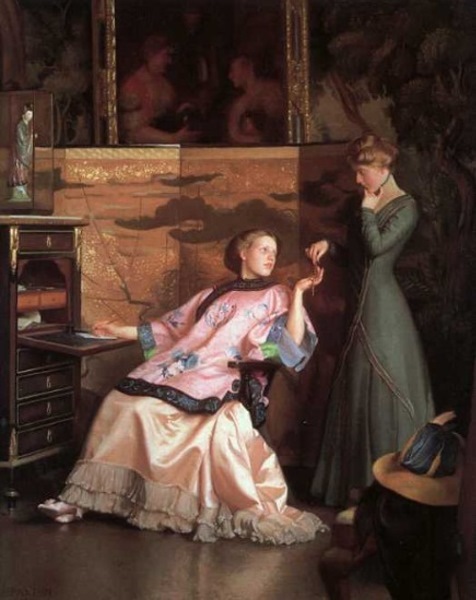 I was looking at a textbook and I came across one of my favorite paintings, "The New Necklace" by William Mcgregor Paxton. Although the woman in the painting is wearing a blouse unlike mine, it follows some of the same design elements. The painting is from 1910 and demonstrates the current fascination with eastern culture prevalent around this time. My blouse also draws upon the style and pattern of various other cultures. In addition, the style of the blouse depicted in this painting reflects a similar loose fitting and unstructured silhouette which is similar to a dolman blouse.